The goal of the Disability Concerns Mission Team to promote inclusion of people who live with disabilities in the life of congregations and in the Presbytery. All Christians are members of the Body of Christ and deserve access to the worship, fellowship, and leadership opportunities in the church. When barriers of any kind exist and make it impossible for persons with disabilities to participate fully in the life of the church, we are not being faithful to our calling or to the mission of the church. It is not enough to enable people with disabilities to enter the buildings. The Body of Christ is not whole when we are not able to embrace the gifts of all members. 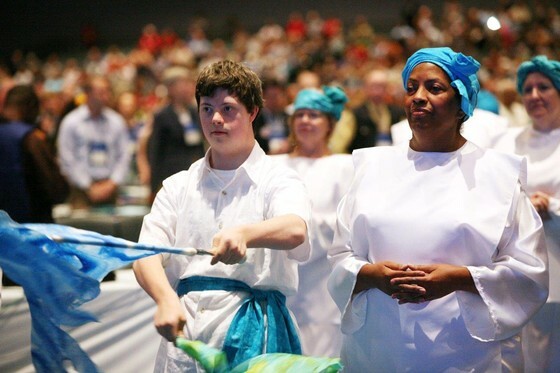 Like all Christians, persons with disabilities have been given gifts to use in the service of God. In addition, persons with disabilities may have gifts of patience, creativity, and perseverance they have learned by living with disabilities. As the POINT (Presbyterians Organized in Nurture and Teaching) representatives for the Presbytery, Sally Narr and Wendy Griffin will assist congregations as they strive to develop strong educational ministries for all ages by providing Christian education support in a variety of ways. She can meet with a church’s education committee, is available at presbytery meetings with a display and answering questions, and help a teacher, a ruling elder, or teaching elder interpret and select resources to meet their congregation’s educational goals. Communicate needs, share ideas, and offer feedback about educational resources and ministries of the greater church through Congregational Ministries Publishing. To nurture our faith through prayer and Bible study,to support the mission of the church worldwide. Questions? Contact the PW Moderator, Michele Gallick via email at: pw@ptcaweb.org.